Bank of Ceylon created history by recording Rs one trillion Balance Sheet at as end May this year. “This is the first time that a corporate entity has achieved this significant mile stone and this could be attributed to strong foundation during the 70 year banking history and working towards a corporate plan. In keeping with the 011012 target – Rs one trillion balance sheet, Rs 10 billion profit and 2012 as the time frame, we were able to achieve both the targets well before the target time,” Bank of Ceylon Chairman Dr. Gamini Wickramasinghe told Daily News Business. The roll-on/roll-off (Ro/Ro) vessel, MV Cygnus Leader of the Japanese NYK Line made its first call at the Magam Ruhunupura Mahinda Rajapaksa Port on June 13. Cygnus Leader, with the capacity to load 6,500 units of vehicles onboard, called at the MRMR Port on its way from Japan to the Middle East and discharged 806 vehicles and machinery manufactured in Japan, Germany, UK and Thailand that was consigned to Sri Lanka. In the first five months of 2012, HSBC has broadened its global renminbi (RMB) network coverage to 59 markets with RMB Trade Settlement capabilities. The recent launch of RMB Trade Settlement services in Jordan further consolidates HSBC's position as the leading international RMB bank and complements its existing RMB Trade Settlement capabilities in 19 Asia-Pacific markets. PCH Holdings Ltd will listed at the Colombo Stock Exchange by way of private placement. “We are listing the holding company by introduction. We have received the approval from the Securities and Exchange Commission (SEC). The purpose of the listing is to capitalize on the appetite for PCH shares in the market. With the listing the public will be able to buy shares by the end of this week or on Monday, PCH Group Chairman S.H.M. Rishan told Daily News Business. Bank of Ceylon rewarded the five Samaritans and three police officers who foiled the Battaramulla Bank of Ceylon Branch robbery last week. BOC Chairman Dr. Gamini Wickramasinghe rewarded them with cash prizes of Rs. 100, 000 each. 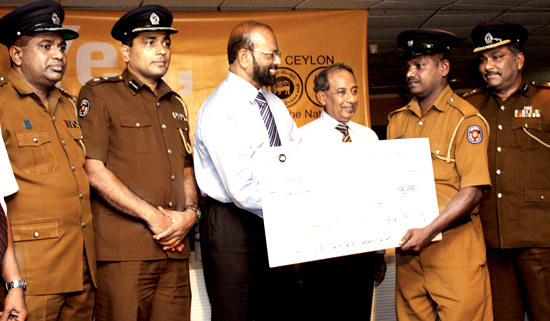 Here Chairman, Wickramasinghe presenting the cheques to the Police officers. BOC AGM Western Province South Nimal Fernando looks on.